Virginia & Truckee coaches Nos. 3 and 4, along with express car No. 1 and mail & baggage car No. 2, were built in 1872 by the Kimball Carriage and Car Manufacturing Co. of San Francisco for the Virginia & Truckee Lightning Express passenger train between Virginia City and Reno. The new train provided first class service between the mines of the Comstock and the Central Pacific Railroad, with connections to San Francisco and the world. In 1874 the V&T purchased four new cars (11, 12, 13, and 14) from Eastern manufacturers for the express train. 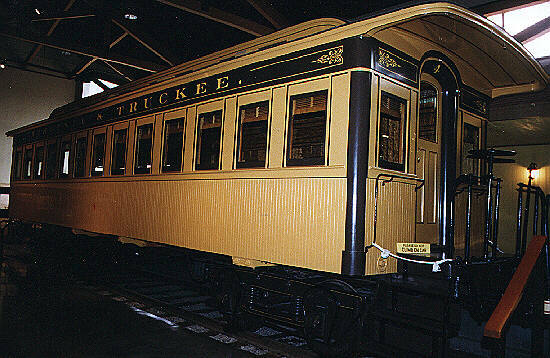 After their arrival, the Virginia & Truckee completely rebuilt the four Kimball cars. The two train sets alternated between summer and winter service for the next several years. In 1878 the V&T again rearranged the cars in its express train: Kimball coach 3 was designated as a smoker, and coach 17 was rebuilt as the regular coach, while Kimball coach 4 was a spare, used when either of the other two cars needed repair. More coaches arrived on the V&T in 1890 and 1906, but the Kimball coaches continued in regular service, including receiving electric lights in 1917. In 1925 the express train made its last run, and the Kimball coaches were relegated to special excursion service. Change came in 1938, when both coaches were sold to Paramount Pictures for use in the movies. They remained in Hollywood until 1972 when Short Line Enterprises acquired them and resold coach 4 to the State of Nevada. In 1984 coach 4 was restored to its appearance in the mid 1880's when it ran in the Lightning Express. Coach 3 was purchased by the State of Nevada in 1988, and is held in the Museum's reference collection for future research.